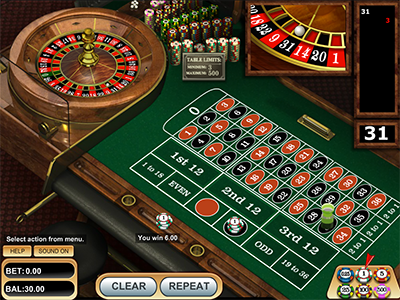 European roulette is by far the most popular form of the game, if not always the most common variety found at land-based casinos. But how does it differ from other versions, such as American roulette, and which online casinos carry the best Euro-style games for real money play with Australian dollars? The Euro roulette wheel and betting layout look much like their American counterparts, but with one key exception: there is no double-zero pocket. That means there are 37 possible outcomes on each spin, rather than 38. Does that seemingly minute discrepancy have any significant effect on the odds of the game? Absolutely. Because there is one less pocket on a single-zero roulette table, the chances of any single number coming up are greater – 1 in 37, to be precise, as opposed to 1 in 38. That cuts the house edge from 5.26 per cent down to 2.70 per cent on all bets, which means players can expect to lose about half as much money in the long run. Our top-ranked real money roulette sites carry titles from the industry’s leading software developers, meaning each of the featured games below offers safe, authentic gameplay with secure random number generator (RNG) technology, user-friendly features and reliable all-round performance. BetSoft European Roulette – If you want a simple single-zero roulette game with clean features, affordable table limits and no unnecessary clutter, this is the game for you. Maximum bets range from $100 to $500 depending on the specific casino site, which is ideal for both the beginner and the punter on a budget, while the gameplay features are about as straightforward as they come. Those who like the feel of the BetSoft layout and want to step up a grade should also try VIP European Roulette – the same game, but with higher table limits. Felt Double Ball Roulette – Available at GdayCasino.com, this unique roulette game does exactly what it says on the tin. The addition of a second ball, which the player has the option to shoot, creates a whole new world of betting possibilities. The payouts on standard roulette bets are decreased, as two balls means twice the chance to win, but there is also a 1200 to 1 jackpot that pays when both balls land on your chosen straight-up number. Microgaming Multiwheel Roulette – Some folks like playing roulette online because they prefer the brisk speed of play over the more sedate pace of land-based tables. Multiwheel Roulette Gold takes that angle to a whole new level by giving players the option to bet on as many as eight wheels at once, all of which are connected to the same single-zero betting layout. Microgaming Premier Roulette DE – Microgaming has many top-notch variants on its books, including the ubiquitous European Roulette Gold Series, but we think the Diamond Edition release is the best of the bunch. The sophisticated audio-visual displays give that immersive, intimate feel you don’t always get with RNG roulette games, while a $2,000 maximum bet is enough to keep even the high rollers happy. NetEnt Professional Series Roulette – It’s hard to go past the Pro Series games by Net Entertainment. Whether it’s regular European Roulette, Roulette Pro, or the Roulette Advanced titles, each comes loaded with quality graphics, easy-to-use features and the option to choose your own bet limits. Players at Guts can stake as little $0.10 per spin or as much as $110,000 – a range you won’t find at any brick-and-mortar Australian casino. Live dealer casinos are a blessing for players who want authentic real-time gameplay without the inconvenience (and added expense) of having to hunt down an affordable single-zero roulette wheel at a land-based casino. The live dealer providers at our trusted casino sites offer a wide variety of real money roulette games that cater to casual punters and VIP high rollers alike, many of which are available for mobile play at Guts online casino on iOS, Android, and other smartphone and tablet operating systems. Each of our recommended real money casino sites is licensed, regulated, and protected by bank-standard Secure Socket Layer (SSL) digital encryption technology. Australian roulette players can choose from a variety of trusted payment methods for casino deposits and withdrawals, including credit cards (Visa, MasterCard), debit cards (Maestro, Visa Debit), virtual prepaid cards (Visa EntroPay), secure e-wallets (Neteller, Skrill), online instant banking (Trustly, iDeal), prepaid money vouchers (Paysafecard) and direct bank transfers. There are two types of standard wagers in roulette: outside bets and inside bets. The former type covers large groups of numbers at once, while the latter focuses on individual selections and combinations of specific numbers. Inside wagers pay better odds, but the outside options are far more likely to win. The outside betting in roulette offers 12 different wagers, each of which comes under one of two categories: even money or 2 to 1. Even money – Black or red, odds or evens, and low (1 to 18) or high (19 to 36) are the simplest and most successful bets in roulette. Each covers exactly 18 numbers (e.g. all the black pockets on the wheel) and pays 1 to 1 odds. Dozens and columns – These options cover only 12 numbers each, but at a higher return of 2 to 1. Players can opt for either the first dozen (1 to 12), second dozen (13 to 24) or third dozen (25 to 36) numbers, or the first, second or third column of numbers as they appear on the inside betting layout. While the outside layout is made up of simple this-or-that propositions, the inside betting features a far more diverse selection with much bigger potential payoffs. Straight up – Bet on a single pocket by placing your chips directly over that number on the layout. Payout = 35 to 1. Split – Bet on two adjacent numbers at once by placing your chips on the line between them. Payout = 17 to 1. Street – Bet on a whole row of three numbers by placing your chips on the line where the first number meets the edge of the layout. Payout = 11 to 1. Trio – Bet on any three of 0, 1, 2 and 3 by placing your chips on the T-intersection between your chosen numbers. Payout = 11 to 1. Corner – Bet on four adjacent numbers by placing your chips on the intersection where all four boxes meet. Payout = 8 to 1. First four – Bet on the first four numbers by placing your chips on the T-intersection where 0 and 1 meet the edge of the layout. Payout = 8 to 1. Six line – Bet on six consecutive numbers by placing your chips on the T-intersection where the two rows meet the edge of the layout. Payout = 5 to 1. Play the very best real money roulette games for PC, Mac and mobile at 32 Red – our top-ranked Internet casino for online players. Sign up today and score a matched deposit bonus on every deposit of $20 or more.